The layers of debris and dirt that smothered Ancient Rome have a tale to tell. Whether that tale agrees with the official narrative is another story altogether. The base of the Column of Phocas in the Roman Forum was buried about twenty-five feet beneath ground level. The base of the column of Phocas, in the Forum, is about twenty-five feet beneath the present level of the Campo Vaccino, and the Forum of Trajan about fifteen feet below the adjoining street. With the exception of the column of Phocas, excavated by the Duchess of Devonshire, of a narrow ledge of the Basilica Julia, and a portion of the temple of Castor and Pollux, excavated by Toumon, all that classic group lay buried under an embankment thirty-three feet high. The official narrative for the Column of Phocas tells of a 2nd century column on a 3rd century pedestal being recycled and dedicated to the 7th century Byzantine Emperor Phocas. 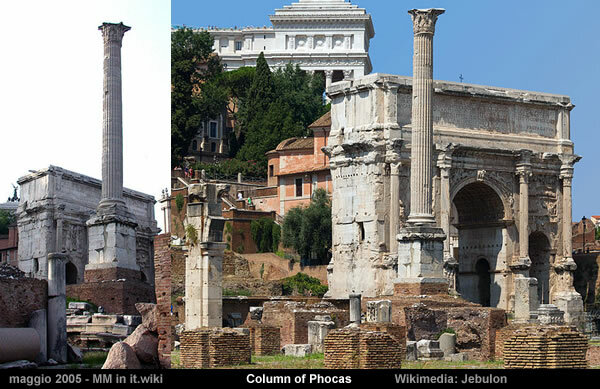 The Column of Phocas is a Roman monumental column in the Roman Forum of Rome, Italy. Erected before the Rostra and dedicated or rededicated in honour of the Eastern Roman Emperor Phocas on August 1, 608, it was the last addition made to the Forum Romanum. The fluted Corinthian column stands 13.6 m (44 ft) tall on its cubical white marble socle. On stylistic grounds, the column seems to have been made in the 2nd century for an unknown structure, and then recycled for the present monument. Likewise, the socle was recycled from its original use supporting a statue dedicated to Diocletian; the former inscription was chiselled away to provide a space for the later text. Phocas (Latin: Flavius Phocas Augustus; – 610) was Byzantine Emperor from 602 to 610. The early life of Phocas is largely unknown, but he rose to prominence in 602, as a leader in the revolt against Emperor Maurice. Phocas captured Constantinople and overthrew Maurice on 23 November 602, and declared himself as Byzantine Emperor on the same day. However, the claimed dedication to Phocas looks suspect. The name of Phocas is erased from the inscription; but the date shows that this monument was to his honour. Historically, there has been a reluctance to release details of the dirt and debris covering Ancient Rome. Thankfully, information is beginning to emerge. 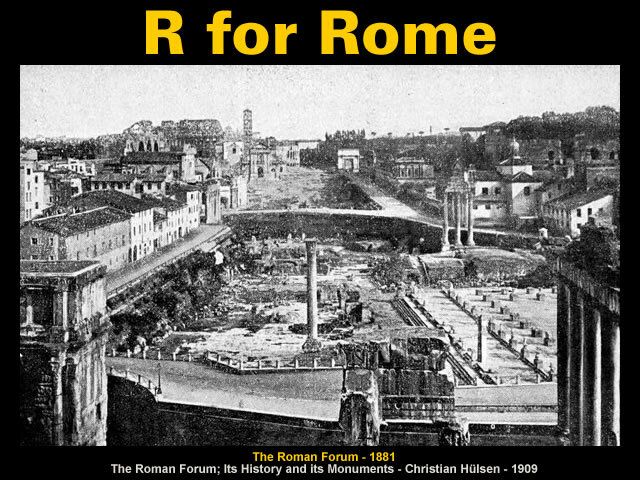 Gunnar Heinsohn has recently secured a more detailed image of Rome’s stratigraphy. 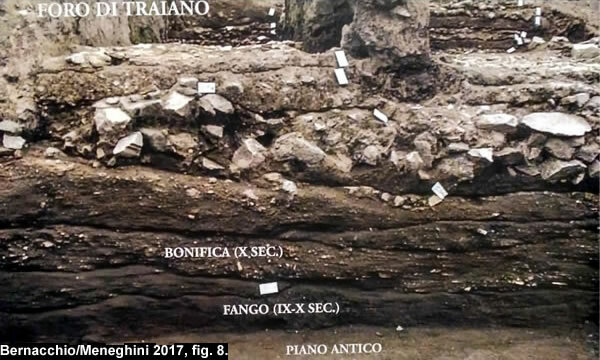 In theory, the stratigraphic layers from the Crypta Balbi in Rome should be fairly well aligned with the stratigraphic layers from Kom El Deka in Alexandria, Egypt. A side-by-side comparison confirms Alexandria and Rome are fairly well aligned. The alignment results provide further support for Leona Libby’s Old Japanese Cedar Tree chronology and the [generally unrecognised] Arabian Horizon centred on 637 CE. The alignment results also suggest Rome – like Milan – only began to recover from the Arabian Horizon in the 2nd millennium CE. The eleventh and twelfth centuries were marked by numerous disasters: fires, in particular the terrible “fire of the Stork”, that in 1071 devoured the basilica, devastating the internal decorations, and earthquakes, that undermined the stability of the complex, making new restorations necessary between the twelfth and thirteenth centuries. 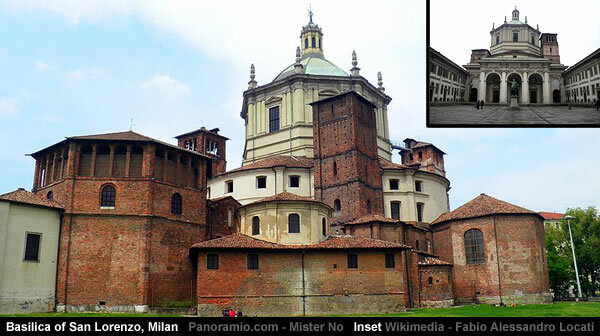 By 1167, with the construction of the medieval walls, the basilica was to be found within the city, at the new Porta Ticinese (Ticinese gate). The alignment results also indicate Byron’s Nameless Column was erected in the 1st or 2nd century AD and – like the rest of the Roman Forum – it began to be buried under dirt and debris during the Arabian Horizon centred on 637 CE. And they confirm the Column of Phocas narrative is pure hocus pocus. Gallery | This entry was posted in Arabian Horizon, Catastrophism, Dark Earth, Enigmatic Egypt, Epigraphy - Inscriptions, Geology, Heinsohn Horizon, History, Old Japanese Cedar Tree. Bookmark the permalink.